Dezeen promotion: terracotta-coloured tiles by manufacturer Agrob Buchtal help to carve up this dwelling in Lithuania's capital, creating cool and warm-toned areas. 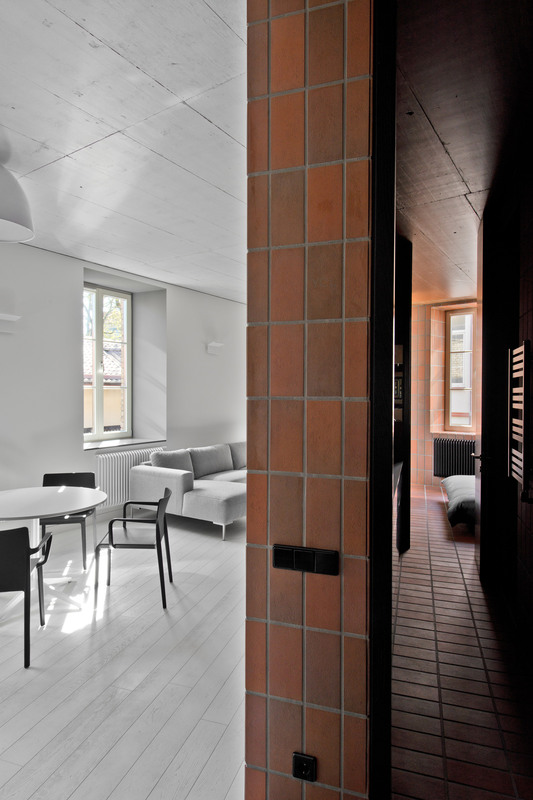 Located in Vilnius' old town, Bazillion is an apartment designed by local practice YCL Studio for a client who frequently travels and wanted a place to stay during short stints in the city. 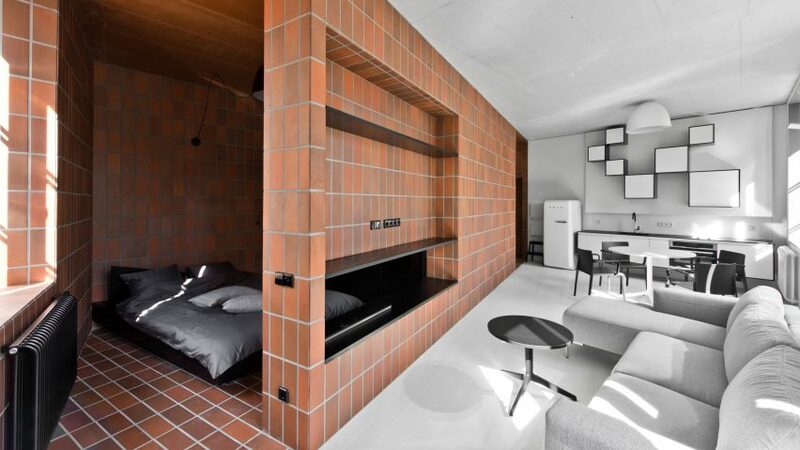 The apartment, which measures at just 45 square metres, is set within a century-old building. In its original state, it had a largely open-plan layout. 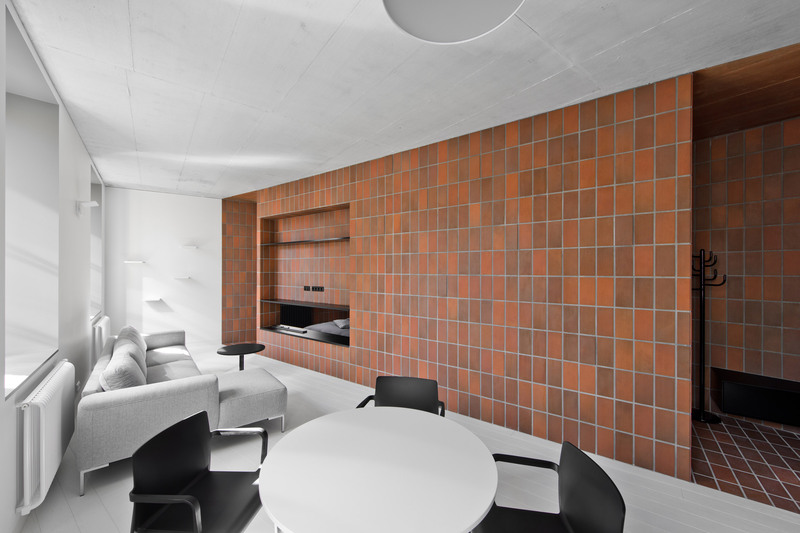 But, to create separate zones, the YCL Studio inserted a slanted wall at the home's centre. One side of the apartment now plays host to the kitchen and living area, while the other contains the bedroom and bathroom. "We imagined that the day is bright, full of light, talks, friends and food, while the nighttime asks for a private, safe and cosy place – a bit dark and sleepy," said Aidas Barzda, an architect at YCL. "This opposition is articulated by drawing a sharp line." 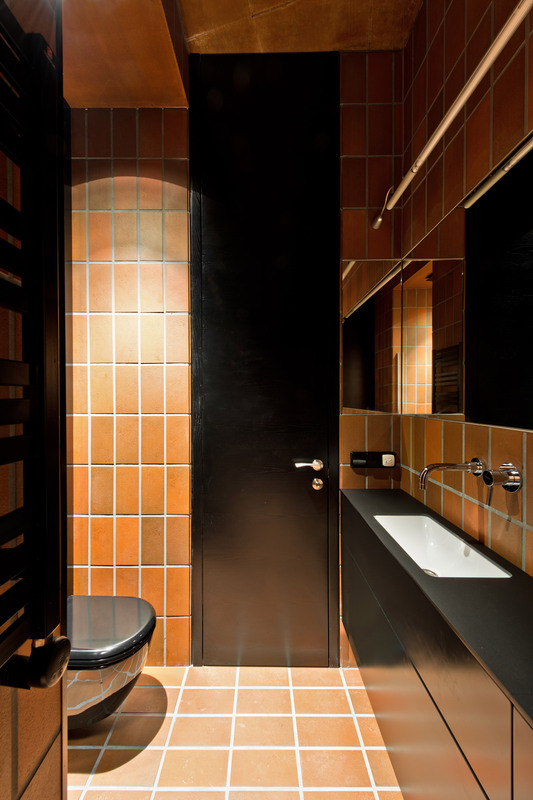 The dividing wall is entirely covered with ceramic tiles from Agrob Buchtal's Goldline series. Established in 1755, the German brand specialises in creating ceramic products for residential interiors as well as large-scale architectural projects. 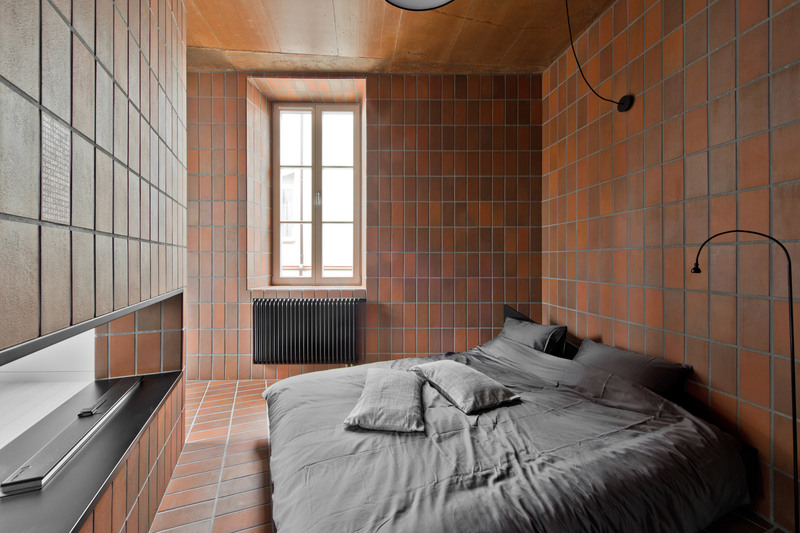 The tiles, which come in earthy tones of red and brown, cover the bedroom's walls and floor. The aim was to create a warm, inviting atmosphere. This contrasts against the cool-toned living and dining area, which features whitewashed ceilings and wooden flooring, alongside pale cabinetry. YCL sees using tiles in a bedroom as a subversion of the traditional use of ceramics, which are typically reserved for "wet" areas of the home like the bathroom. "We wanted to use a natural material which could fill the space and would suggest that it would be there permanently," explained the designers. "Tiles have been liberated from their common, limited role, and have become the front and centre of the interior." Black and grey furnishings are included throughout, to visually tie the two halves of the apartment together. 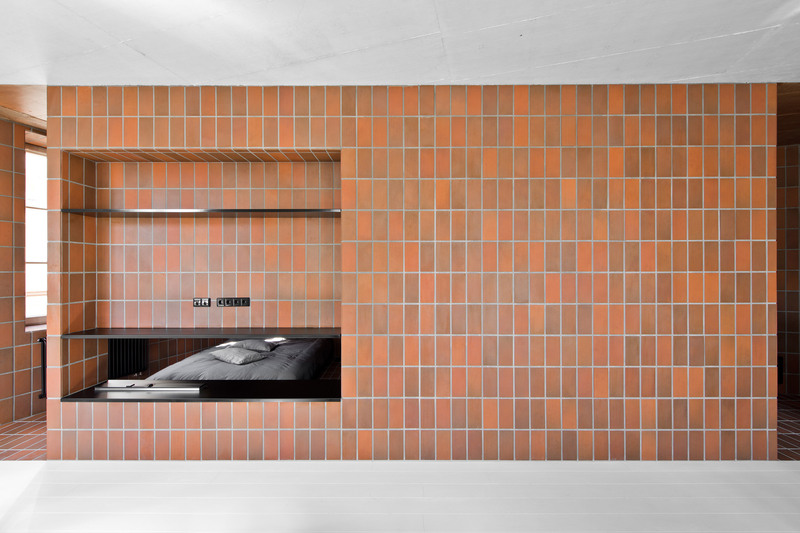 To find out more about Agrob Buchtal's tiling collections, visit the brand's website or its Facebook page.